Sara Garcia was born and raised in South Texas. She is the daughter of a migrant farm worker, and a rancher, both of whom are first-generation Americans and college graduates. Sara earned her B.A. in psychology from Boston University in 2012 and her M.S. in psychology from the University of Texas at San Antonio in 2014. Sara is currently pursuing her Ph.D. program in education policy at the University of Illinois at Urbana-Champaign. As an undergraduate, Sara served on the Boston University Admissions Student Diversity Board and assisted with research with the BU College of Education, where she worked to increase diversity on campus, facilitate minority outreach in South Texas, and build a capacity for educational research. In her master’s program, she focused on the influence of gender and culture on nutritional habits among Hispanic pre-adolescents. She also worked at a local youth alternative home, and as a caregiver and tutor, which fueled her passion to improve access to higher education for minority youth. As a Ph.D. student, Sara has worked as a graduate research assistant for the Office of Community College Research and Leadership (OCCRL). As a CHCI Higher Education Fellow, Sara seeks to enhance her knowledge of education policy and ways in which educational research can be utilized in the policy-making process to improve the success of Latinos at post-secondary institutions. 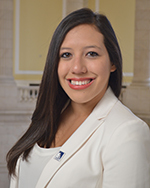 Sara is determined to utilize the skills she gains through her time in Washington D.C. to aide in her efforts to promote degree attainment among Latinos.